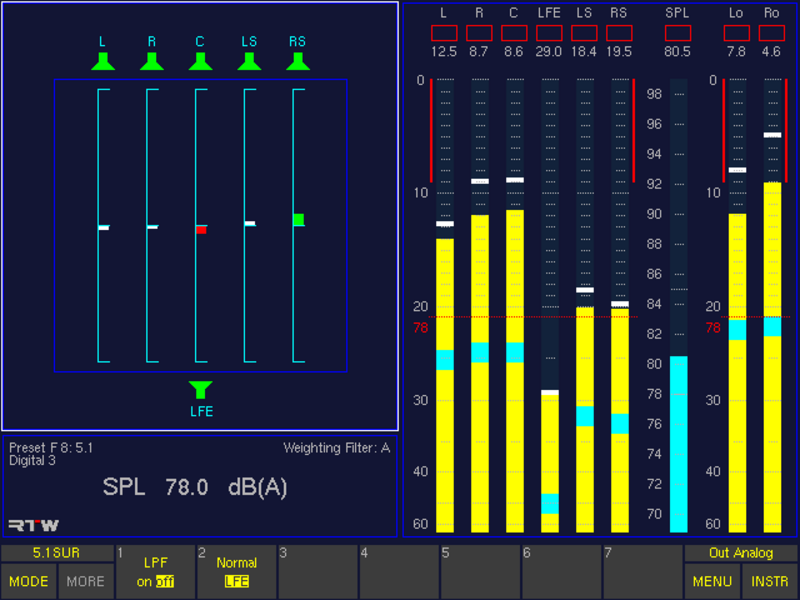 SurroundControl is our flagship product line for controlling, analyzing and monitoring stereo, surround sound and multichannel programs. 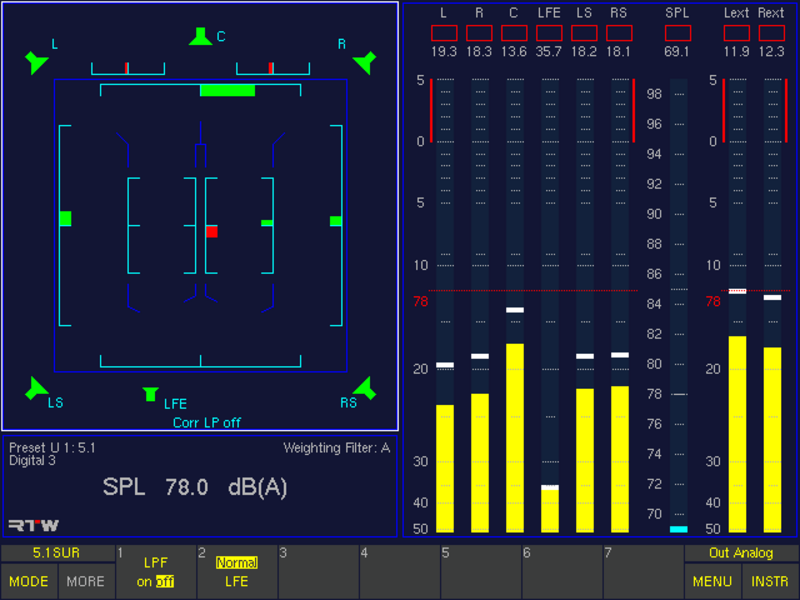 It combines the metering functions of the RTW surround display devices and the control functions of an eight-channel monitoring controller - a true high performance system. Loudness measurements of version 4 follow all relevant loudness standards: EBU R128, ITU-R BS.1770-3/1771, ATSC A/85 and ARIB. Therefore, extensive functions are available. 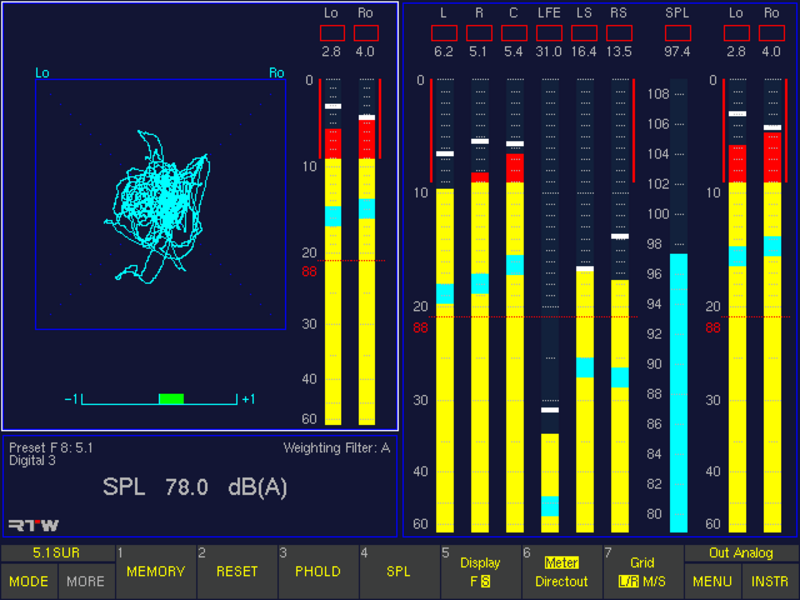 For example, the LRA instrument combines the measurement and visualization of two critical loudness parameters (program loudness, loudness variances within short time periods) in a straightforward and intuitive way. 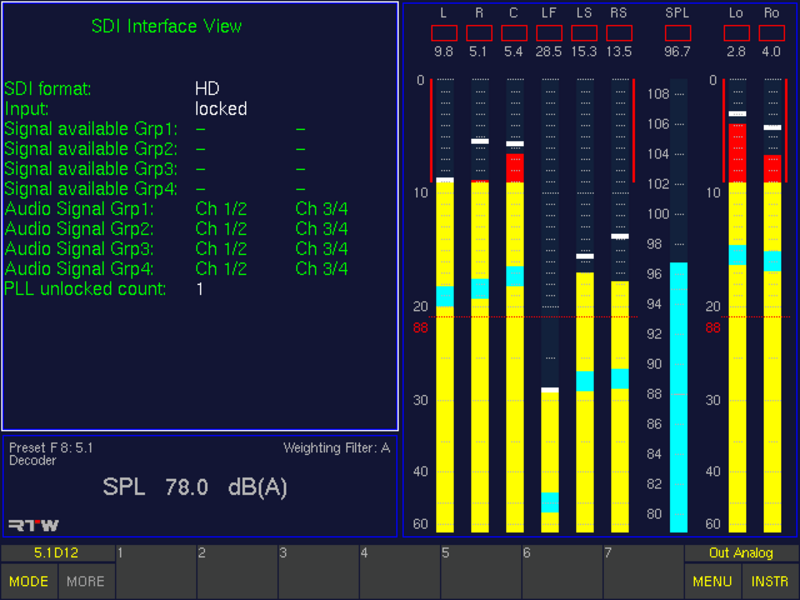 The 3G/HD/SD-SDI deembedder interface option expands the audio signal analysis to 3G-SDI data streams and surround format 7.1 DD+. Depending on the model SurroundControl is already equipped with it. All delivered version 4 units can be upgraded by factory (--> see Options). For existing units with software version 3 (03.00.nn) an upgrade kit to version 4 is available. The current V04.00.49 software update for existing version 4 units is available for download at SurroundControl/SurroundControl 31900 section of members area. This device is no longer available! Remote Display. 8.4" TFT VGA display with keypad, table-stand, power supply and VGA cable. 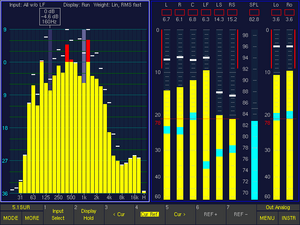 The Loudness Meter (right, marked with white frame) acc. 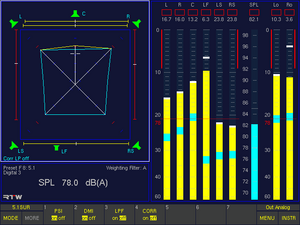 to current guidelines (EBU R128, ITU-R BS.1770/1771, ATSC A/85, ARIB) shows from left to right three channel groups: the first group displays the RLB weighted loudness for each channel with additional True Peak bargraphs, the second group displays the summed momentary loudness of all channels ("M"), the integrated mean momentary value for a dynamic time period (shortterm "S"), and the loudness value of an integrated longterm reading ("I"), the third group displays the new LRA instrument in "MagicLRA + I + Num" mode. 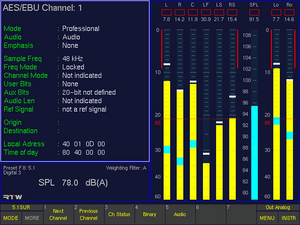 The Peak Program Meter (right, marked with a white frame) displays several channel groups (up to four depending on the selected format). The picture shows: peak level of each channel acc. 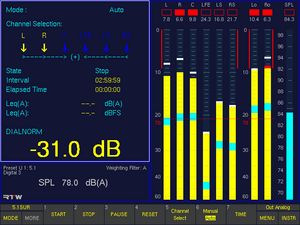 to selected standard with additional peak hold and SPL RMS indicators, bargraph with summed SPL level, pair of bargraphs for the display of an internal generated downmix signal. 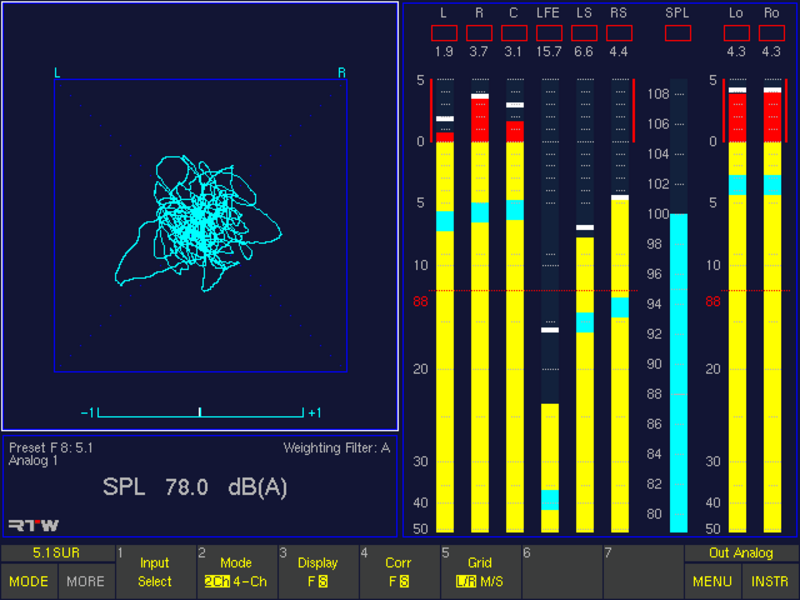 The Surround Sound Analyzer (House display, above left, marked with a white frame) is a powerful tool for visualizing the interaction of all important parameters of surround signals. The dynamic behaviour of all display elements corresponds to the subjective listening impression, enabling you to see the balance of a surround programme intuitively and at a glance. 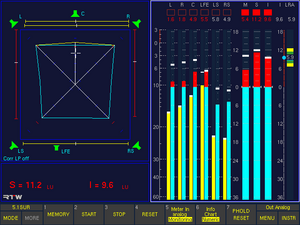 The Audio Vectorscope (above left, marked with a white frame) is a high quality Lissajous display for stereo signals available in surround modes and for all modes with stereo channel pairs showing the phase relationship of two channels in real time. Additionally, a corresponding phase meter is displayed. 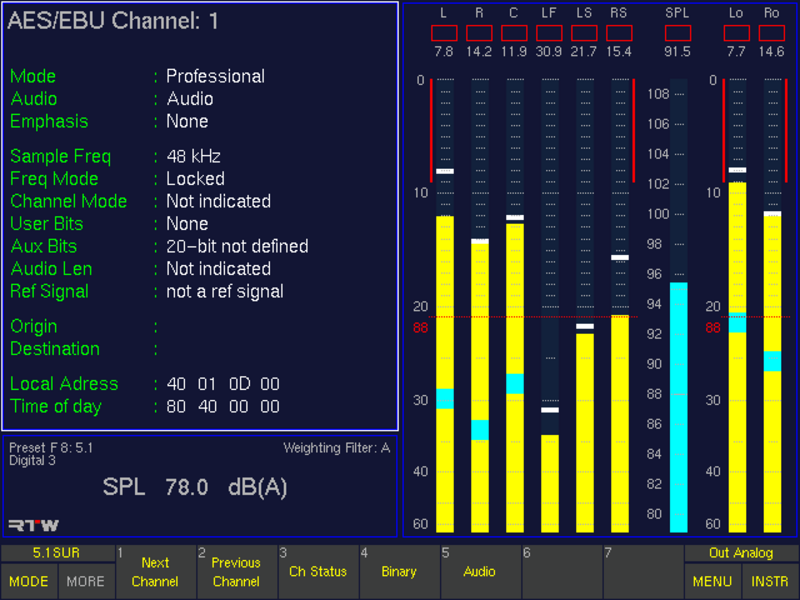 The Multi-Correlator (above left, marked with a white frame) is a mulit-fold display mode with up to ten phase meters for all possible channel pairs, graphically placed inside a 5.1 speaker setup. 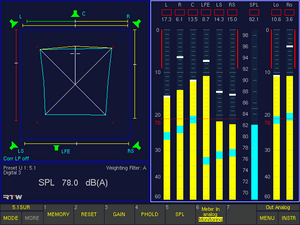 To obtain a view of the "surround envelopment" effect an optional 300 Hz low pass filter can be activated. The LFE mode of the Multi-Correlator (above left, marked with a white frame) displays the phase correlationship between every single channel of the selected surround format in relation to the LFE channel. 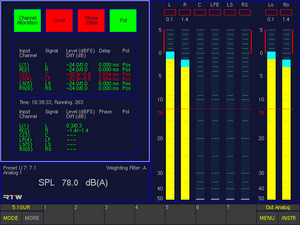 In 5.1 format correlators L/LFE, R/LFE, C/LFE, LS/LFE, RS/LFE are displayed. The 1/3 octave Real Time Analyzer (left, marked with a white frame) displays the spectral distribution of individual channels or channel groups using 31 bands with 1/3 octave intervals and an additional HF band. 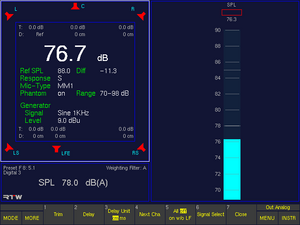 Additional functions for easy evaluation: peak hold, display hold, band cursor and cursor readout. 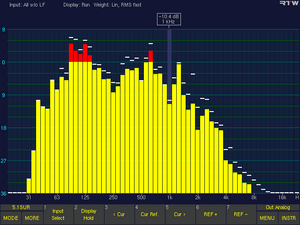 The 1/6 octave Real Time Analyzer displays the spectral distribution of individual channels or channel groups using 61 bands with 1/6 octave intervals and an additional HF band. 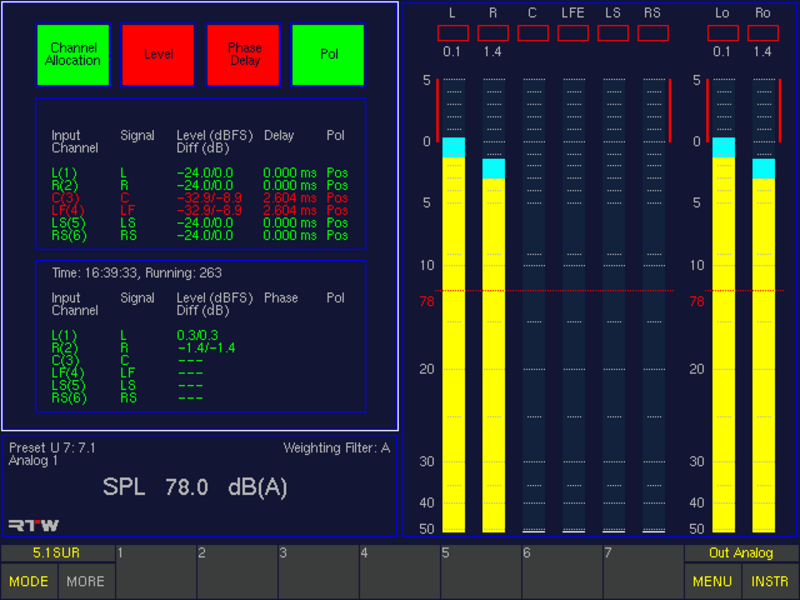 Additional functions for easy evaluation: peak hold, display hold, band cursor and cursor readout. The 2-Channel Downmix Meter (above left, marked with a white frame) displays the levels and the correlation of the internally generated two-channel downmix signal. 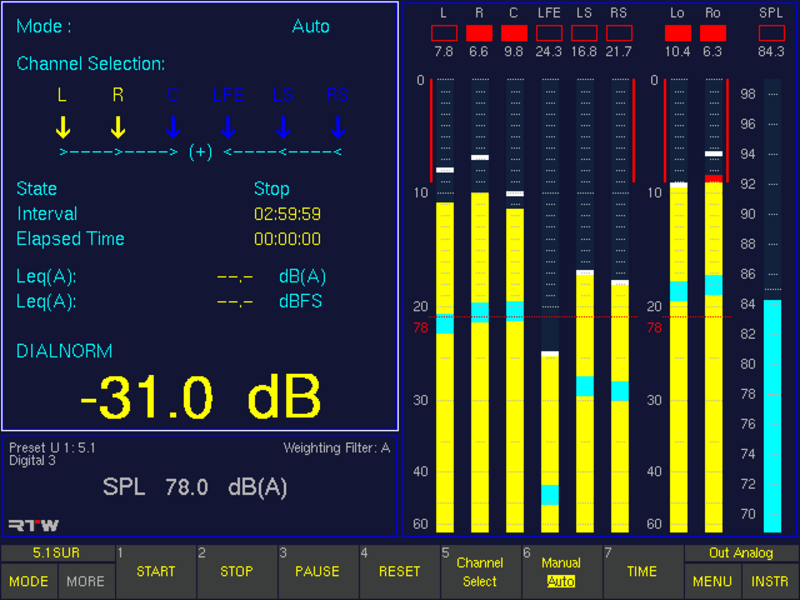 It either can be metered and switched to the front loudspeakers or directly given out via the output connectors and then be monitored with the downmix meter. 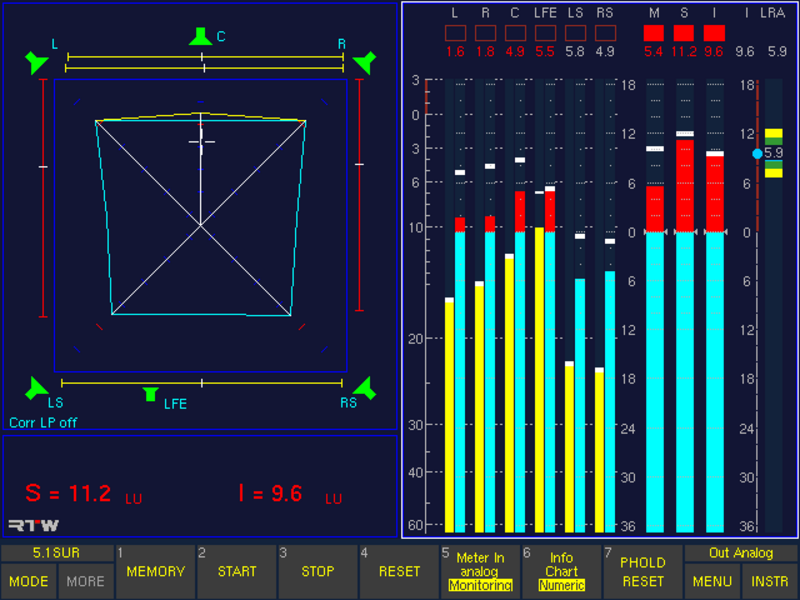 The instrument also features an audio vectorscope. 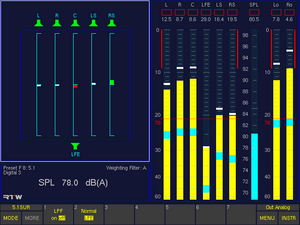 The Monitoring Instrument (above left, marked with a white frame) is used to manage the functions configuration settings of the Monitoring Controller, like state of the loudspeakers, level trim offset, delay, listening level setting, reference level, dimming level, and selected mode for mono. 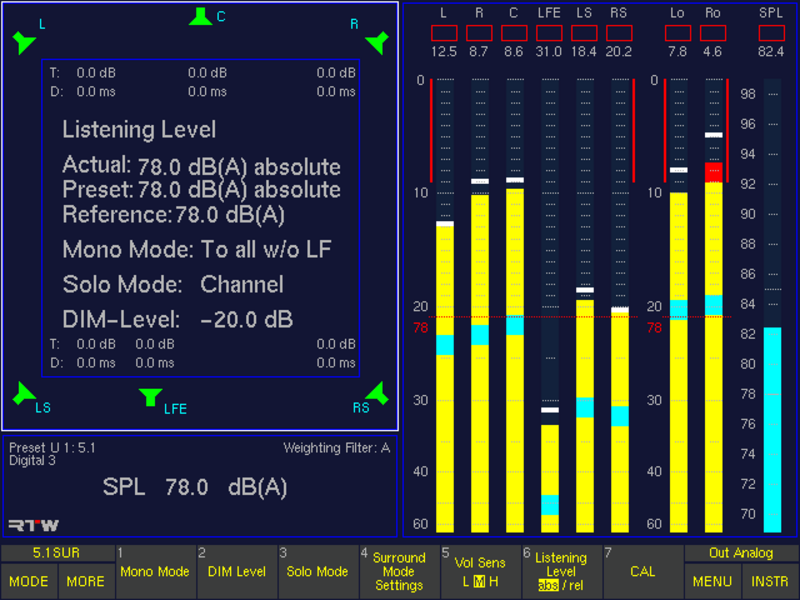 It also includes the instrument for calibration containing trim and delay parameters, an SPL meter, and a test signal generator with various signal options for calibrating the studio environment. 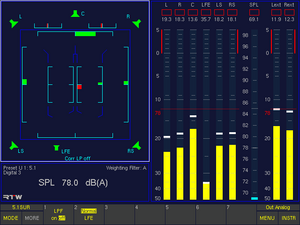 The Calibration Instrument (above left, marked with a white frame) with SPL bargraph (right) provides an 8-channel test signal generator with sine wave signals or pink noise with a variety of bandwidths and level, and an SPL meter with a calibration microphone preamplifier for calibrating the sound monitoring system. 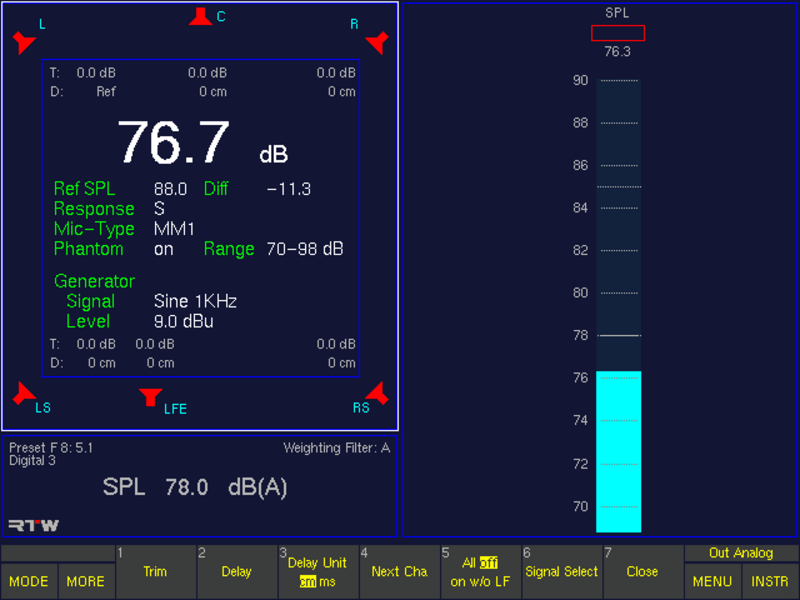 Called up from the SPL meter, the RTA 1/6 is available automatically using the measuring microphone input. The AES/EBU Status Monitor (above left, marked with a white frame) displays the status bytes and signal status information like confidence, lock, coding, parity, validity from the AES/EBU data stream as plain text. 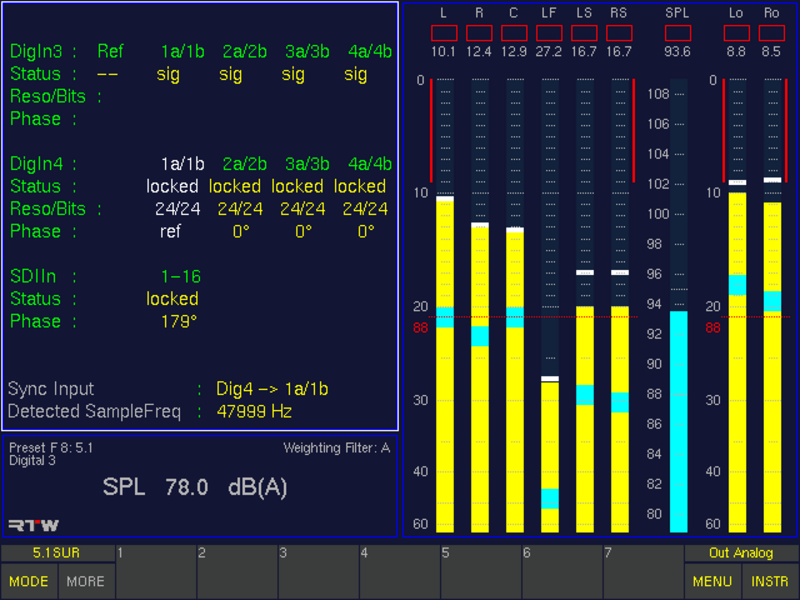 It also displays the audio data bits and their activity. 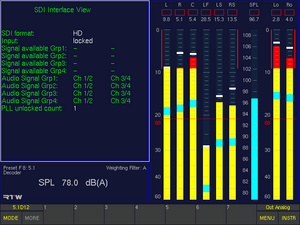 The SDI Interface Status Display (above left, marked with a white frame) shows the status of the interface, the SDI format, and the included and available audio signals and signal groups, if the HD/SD SDI deembedder interface is installed and activated. The Hardware Status Display (above left, marked with a white frame) shows the status of the digital inputs as well as the resolution and bits, the phase relationship, the sync reference and the detected sampling frequency. 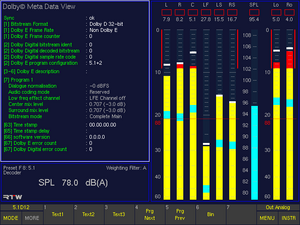 The Dolby® Meta Data Monitor (above left, marked with a white frame) displays the meta data included in a Dolby® encoded data stream, if the Dolby® E and Dolby® AC-3 decoder is installed and activated. 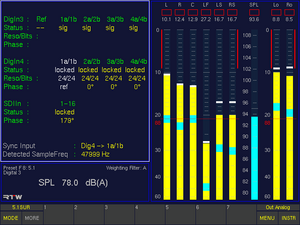 The Dialnorm Meter (above left, marked with a white frame) calculates and displays Dialnorm values from the digital inputs. Dialnorm is used in film sound mixing and describes the normalization of the dialog loundness level with respect to a certain reference monitoring level. 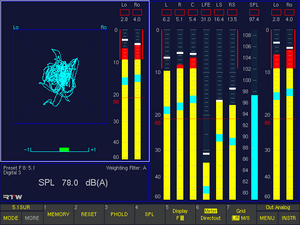 The BLITS 5.1 Surround Identification Instrument (BLITS: Black's and Lane's Ident Tones for Surround, above left, marked with a white frame) is an intelligent analyzer for incoming BLITS sequences showing the signal states and marking conspicuous channel swapping, level differences, phase shifts, delays and polarity issues. 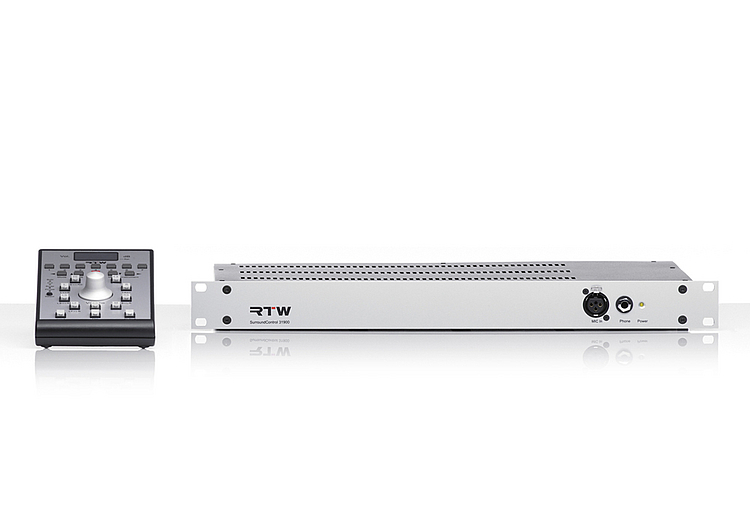 For identification an prevention of unintentional channel swapping an integrated signal generator also supplies a BLITS signal cluster that can be routed directly to the outputs. can be found in our members area.